Background: When Michigan became a state in 1837, there were thousands of wolverines roaming the state. 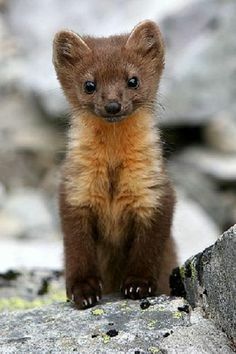 So when the day came to choose a state animal, the winner was the wolverine. 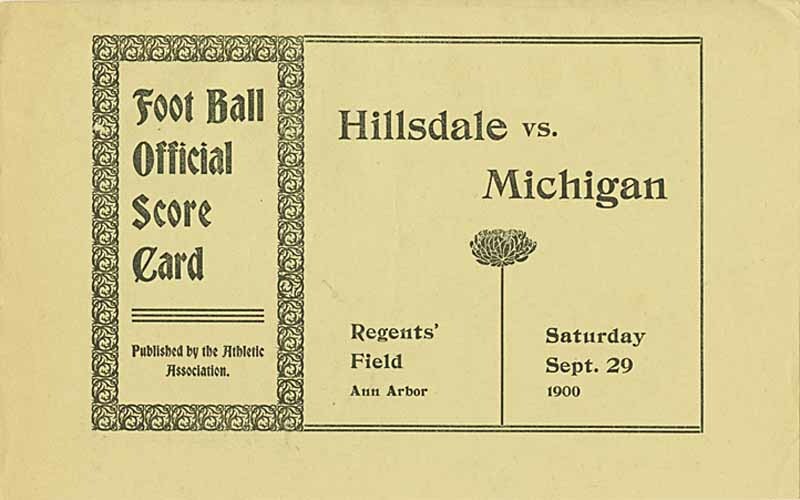 When the University of Michigan began playing intercollegiate football in 1879, they were the Michigan Wolverines. 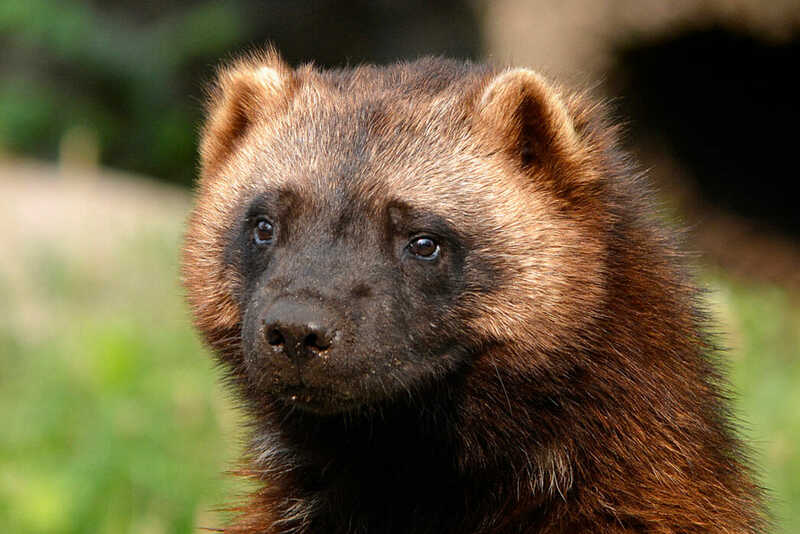 By the middle of the 20th century, wolverines were scarce. By 1997 there were no wolverines in Michigan, and the white-tailed deer became the state animal. Jimmy: Dad! Did you hear the great news? Some humans are going to play a game called football. 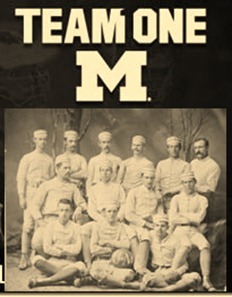 And they named the team after us wolverines because we’re so tough. Dad: That’s nice, Jimmy. Now help me catch something for dinner. Walter: This meal is delicious. I never knew you were such a good hunter. Emily: Thank you sweetie. I heard something terrible from Betty. Do you remember her nephew Benny? Walter: Not really. She has about twenty nephews. Emily: Anyway, some humans got him. Walter: That’s awful. Did they turn him into stew? Emily: No; that’s the strange part. They put him in a cage and said they were taking him to school as a mascot. Emily: Betty wasn’t really sure, but they said he’d be great on the sidelines. Joe: You’ll never believe who we saw today! Joe: George! That guy that the humans trapped last year to take to school. Peggy: Really? How’d he get out? Joe: A few of the humans took him out of his cage. They wanted to paint him maize and blue. He didn’t know what it meant but he saw his chance, bit a guy, and raced out. Well, we don’t really race, but you know what I mean. Peggy: So did he tell you what a mascot is? Joe: Apparently when these humans play a game, they like to have a tough animal to represent how tough they are. And if they actually have one of those animals, they show it off to intimidate the other team. Peggy: Goodness! How awful for the animal. Joe: George said it wasn’t as bad as it sounds. They fed him as much as he wanted and walked him and gave him a good place to live. But the games were really noisy. And they wouldn’t let him eat any of the injured players, even if they were on the other team. Peggy: Humans are strange. You would think they would want to eliminate as many enemies as possible. Joe: George said that they will look for a replacement. We all need to move. Paul: It looks like it might be time to move north again. Jan: But it’s so nice here. We have the lake, the sun spots, the children have lots of friends. And there’s plenty to eat. Paul: It seems that some of those “football players” live around here. They took Jenny with them when they went to school. Jan: Oh, no! They took a girl? Paul: Yep. But humans are clueless. They probably can’t tell the difference. Bill: We’re going to have to do something. Those humans can still find us up here. Pete: I heard that some of the other students want us as pets. It’s ridiculous. Don’t they know we’re vicious? Bill: I heard that some of the girl humans think we’re cute. Don: Hon, I don’t want to scare you, but the students found us again. They have some kind of contest to see who can capture the biggest, meanest wolverine as mascot. The rest are going to be pets down there. Ann: I am frightened. You’re a big, mean guy. What if they take you? Don: It’s OK. The guys and I have a plan. Tonight we’re all going to move over the border to Wisconsin. Ann: Don’t they have mascots in Wisconsin? 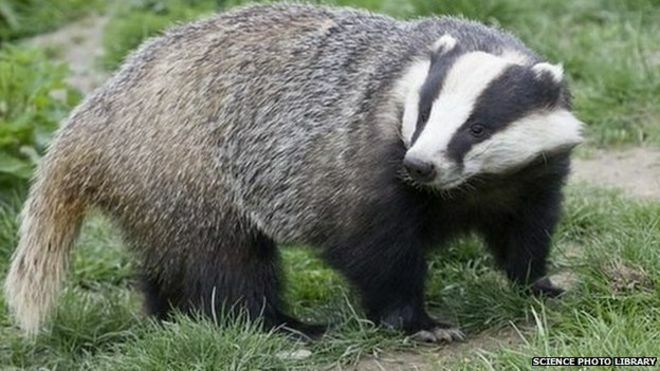 Don: Yes, but they’re badgers. And the fewer of them the better. Note: Cat is a Michigan alum and would never have a wolverine as a pet. Go Blue! Why do we say, “I just have a cold,” when someone asks why they can’t understand a word coming out of our mouths? Are we trying to separate it from the Dengue Fever going around the neighborhood? Are we ashamed that we don’t have something more impressive? I have never met someone with a cold who was not totally miserable. (Some of them were that way before the virus, so they don’t really count.) But we have made it some type of badge of honor to go on as if nothing were wrong. As in, “I came to work today; it’s only a cold.” Well you look like something the dog dragged in from the dumpster, thanks for wanting to share it with me. They sit next to you, coughing and blowing their noses, not noticing that you’re about to gag. Honestly, nothing you do here is so important that you can’t miss a day or two. Then you have places like my store. Without sick time (and with low wages), the average employee really can’t afford to stay home. It works out well for the company – turnover is so high that there really isn’t anyone else to do the job. Besides, the odds are that you are making the customers sick, not the other employees. So it’s kind of a win-win for the company. The odds of the customer figuring out it was an employee making them sick, rather than the toddler coughing all over everything, are pretty low. Usually people write it off to “something going around”. I always picture little viruses dressed like spies in the cartoons. So you can probably tell that I have been sick, and am pretty grouchy about the whole thing. It started with a sore throat. You need to understand that I live in Michigan. There is ‘something in the air’ here, and that something makes it impossible to breathe clearly for approximately half the year (the other half is extremely cold so you more worried about your nose falling off than working correctly). I’m not sure what sinuses are supposed to do, but it must have something to do with carrying around extra gunk your body doesn’t need. I know people who have gotten off the plane saying they felt fine when they left home, but are now sick. Generally, they have a miraculous recovery once they get home. I remember reading somewhere that the government sent out scouts after the Civil War to find places for the expanding population to inhabit. The report came back from Michigan that it was dismal and swampy; basically unfit for human habitation. I’m guessing they came in early spring when the weather changes constantly and everyone looks and feels groggy. I would have liked to remind them that Washington, DC is built on a swamp. And they are the same people who had granted us statehood thirty-some years earlier. I’m telling you all of this not to slam Michigan. It’s beautiful, I love it, and I wouldn’t live anywhere else. But to explain why I could have a sore throat for a week and not really think anything of it. So I go to church and see a friend. He laughs and says something about my sinuses. I tell him that for once it’s not in my head, it’s in my throat (is that technically part of the head?). It’s been getting worse, and I think it may be infected. I make it through the service. (I bet God knows I didn’t actually understand anything that was going on). My friend tells me to go home and see a doctor if it really is an infection. I am happy to report that my friends are generally people with some common sense, not the sort who hear sore throat and immediately think diphtheria. Of course, I don’t see a doctor. I always feel like I should be sicker before I go. By Tuesday, I feel a lot better. I knew it! I wasn’t sick enough to see a doctor! Unfortunately, on Wednesday I didn’t feel quite so well. By Friday, I could barely talk and felt like someone was shoving an ice pick in my ear. I broke down and called the doctor. Turns out whatever was in my throat had decided to move into my ears. They were both infected. I had no idea adults even got ear infections (kinda stupid when I realized that I still get skinned knees and other things that adults should be ‘beyond’). One of the things that causes problems with ear infections is drastic change in temperature (something about a change in pressure – I think I should have paid more attention in Physics). Working in and out of a cheese cooler is not optimal. So I took a day off. But it wasn’t because I had a cold.